A mysterious man informs a group of strange beings that it is the time to strike. Ichigo Kurosaki wakes up in Zangetsu's dimension and receives a warning of what is about to happen. Meanwhile in Seireitei, the captains and lieutenants of Gotei 13 begin to feel their zanpakutō's detachment from them, but do not understand what it means. At night, a group of ryoka attempts to enter Shigekuni Yamamoto-Genryūsai's abode. Yamamoto and Sasakibe confront the intruders but what they see leaves them in shock. Later, the captains and lieutenants are ordered by Yamamoto to gather at Soukyoku Hill. Upon arriving there, they are met by the mysterious man, who calls himself Muramasa. Sajin Komamura attacks the intruder with Tenken but instead of hitting Muramasa, Tenken attacks Komamura. Reappearing as a human form, Tenken strikes down Komamura. 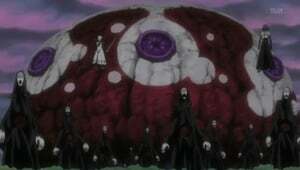 The rest of the Soul Reapers prepare to attack but find themselves unable to release their zanpakutōs. Their zanpakutōs take on human form and stand beside Muramasa, who tells the Soul Reapers that their zanpakutōs have renounced them and declares war. Ichigo finds Rukia injured in the world of the living, and that she is being attacked by a strange woman, who uses rukia's abilties. It is revealed to be that this woman is Rukia's Zapakuto, Sode no Shirayuki. Ichigo successfully forces the renegade zapakuto into submission, and Sode no Shirayuki retreats back to soul society. Ichigo brings Rukia to the Urahara shop, where she reveals that the Shinigami's zanpakuto's have attacked their masters, and reveals that Byakuya was seemingly defeated fighting by his own zanpakuto, Senbonzakura. The remaining shinigami of the gotei 13 squads regroup to the 4th Division headquarters while they try to re-establish their defenses, and learn more about the zanpakuto rebellion. and Urahara observes that only the Zapakuto in Soul Soceity are affected and that those in the real world are unaffected, and decides to try to capture one of the materialized zanpakuto in an attempt to learn more about their new enemy. In the middle of the night, Rukia leaves for Soul Society, apparently in search of Byakuya. Ichigo and Yoruichi leave for soul society in an attempt to go after Rukia and save soul society. Rukia rushes back to the 6th Division HQ and is reunited with Renji. However, Byakuya's status remains unknown after the night of the zanpakutōs' attack. Ichigo and Yoriuchi arrive in Soul Society and split up to search for clues. Rukia returns to Byakuya's compound and finds Sode no Shirayuki attacking and freezing the shinigami there. She tries to reason with her zanpakutō but Shirayuki demands her freedom. After a fierce battle, Rukia loses to Shirayuki and is about to be frozen to death when Ichigo arrives to rescue her. However, he too is defeated by Shirayuki. Rukia attempts to get Sode no Shirayuki back to her by telling the zanpakutō how important she is to her. Using her kidō powers to restrain Sode no Shirayuki and herself, Rukia attempts to sacrifice themselves both in order to convince Shirayuki one could not live without the other. The resulting explosion injures Rukia severely. Sode no Shirayuki has a change of heart and attempts to reach out to her master, but Muramasa arrives and holds her back. Muramasa introduces himself to Ichigo and states that he is a zanpakutō. Muramasa sends Sode no Shirayuki away, and Ichigo asks why he wanted the zanpakutō to gain independence over the shinigami. Although he does not give the reason, Muramasa replies that zanpakutōs can seperate themselves away regardless of being the soul of a shinigami, and he is a good example of one. Ichigo cannot accept this view and attacks him. Muramasa uses illusions to overwhelm Ichigo and pins him to the ground, where he proceeds to drag Zangetsu out of him. Once Zangetsu manifests, he immediately attacks Ichigo. 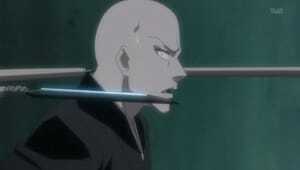 Meanwhile, Mayuri begins experimenting on himself in order to research the zanpakutōs' manifestation. 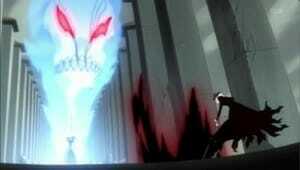 After Zangetsu seemingly defeats Ichigo, Ichigo transforms into his hollow form and strikes back. After a while, he transforms into his stronger form and easily beats down Zangetsu. Muramasa tries a sneak attack but Ichigo immediately regenerates and attacks him. Before the hollow form can do anything else, Ichigo manages to return to his shinigami form and falls unconscious at Muramasa's feet. Rukia is found by the 4th Division and sent to recover from her injuries. Hisagi and his men patrol Seireitei and are attacked by the sadistic Kazeshini. Renji searches the ruins for any clues of the missing Byakuya, who was last seen hit by Senbonzakura's attack. He instead encounters Zabimaru in its baboon and snake humanoid form. 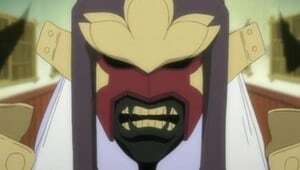 Both entities of Zabimaru have no intention of returning to their original owner and attacks Renji. Ichigo wakes up in Zangetsu's dimension but the old man is missing. He sees Muramasa and attacks him, but the man immediately incapacitates him and summons his hollow form out as a separate entity. Muramasa has begun to take an interest in the hollow form and uses his powers to freeze it in place. Thinking that it has been subdued, Muramasa approaches it but the hollow form merely tricks him with its act and lashes out straight at him. 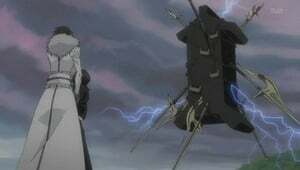 Kyoraku and Ukitake discuss the possibility that defeating the zanpakutō spirits will destroy the zanpakutō themselves. Renji continues fighting with Zabimaru, who taunts him for his weakness. Hisagi fights with Kazeshini, and, disgusted by his desire to take life, plans on killing him even if he loses his zanpakutō. Ichigo's inner hollow fights with Muramasa inside his mind until Muramasa uses his powers to restrain him. Ichigo then steps up to fight, stating that the hollow is a part of him, too. Ichigo manages to force Muramasa outside of his mind and continues the fight with him there. When Zabimaru threatens to kill Rukia, Renji regains his resolve, and manages to activate Zabimaru's shikai. Hisagi is wounded in a surprise attack by Kazeshini, but Izuru intervenes to help him, and using kido, binds Kazehini long enough for the two of them to escape. Renji's fight with Zabimaru continues, and Zabimaru takes the advantage when they are able to activate bankai while Renji, no longer able to control them, cannot. Renji considers his own weaknesses, and tricks Zabimaru into taking his sword, then breaks it with a Red Flame Cannon kido spell and uses Higa Zekkou to defeat Zabimaru by firing the broken shards at them. 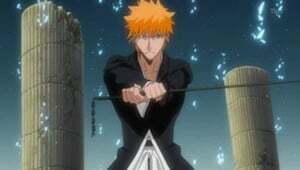 Ichigo fights Zangetsu, and struggles when Zangetsu activates Bankai. He uses a new Getsuga Tenshou working together with his inner hollow to defeat Zangetsu, and forces Muramasa to retreat. 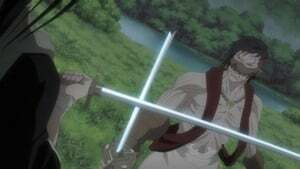 Zangetsu reveals that Muramasa is using a technique to awaken the zanpakutos' instincts and by doing so, he can control them. 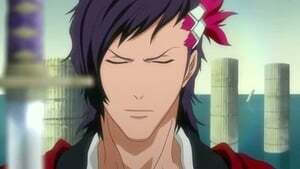 Ichigo reports his findings of Muramasa's abilities to Ukitake, Shunsui and Unohana. 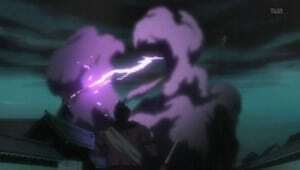 In order to find out about Muramasa's effects on zanpakutō, Ichigo and Ikkaku patrol Seiretei to seek out the entities. Meanwhile, someone breaks into a compound and knocks out the Soul Reapers guarding the area. Ōmaeda and his men stumble on the unconscious guards and investigate, only to encounter his zanpakutō spirit, Gegetsuburi and Hozukimaru. Ōmaeda and Gegetsuburi are just about to fight when Ichigo and Ikkaku interrupt. Ōmaeda is knocked out of the fight, leaving Ichigo to battle Gegetsuburi, while Ikkaku fights Hozukimaru. Ichigo defeats Gegetsuburi but Ikkaku is wounded by Hozukimaru's bankai. Just as he attempts to continue the battle, Ukitake, Shunsui, Soi Fon and her Stealth Corps arrive to surround Hozukimaru, but he uses his bankai to get away. However, they manage to obtain Gegetsuburi. Ichigo goes after Hozukimaru, but the entity escapes when Senbonzakura's petals block Ichigo's route. Ichigo discovers that the attack was from Byakuya, who disappears. Ichigo continues searching for Byakuya, and encounters the spirits of Tobiume and Haineko, who are looking for Hyourinmaru. Momo and Rangiku arrive to fight their zanpakutos while Ichigo continues the search. Momo uses a kido spell to knock Tobiume into Haineko, causing the two to begin arguing. Ichigo encounters Hyourinmaru, who cannot remember his name or that of his master. 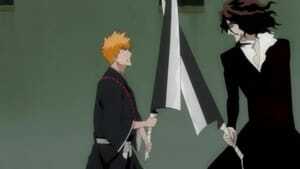 He attempts to freeze Ichigo and leave, but Toshiro confronts him. Elsewhere, Muramasa kills a large number of hollows, including several Menos Grandes. 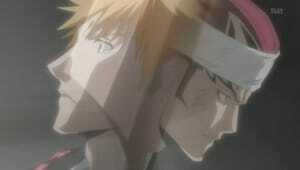 Ichigo is still trapped in the ice prison Hyorinmaru imprisoned him in as Toshiro and Hyorinmaru confront each other. Meanwhile, Momo and Rangiku fight their zanpakutos in the woods and finally manage to overpower them with kido spells. 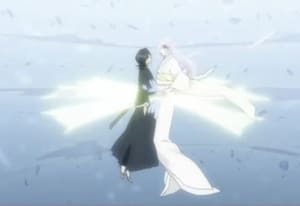 As Hyorinmaru and Toshiro begin to fight, Toushiro tries to seal him but is shocked as Hyorinmaru effortlessly dissolves the seal into fragments of ice. As their fight continues, Hyorinmaru's tremendous power turns the whole of Soul Society's sky black. Mayuri experiments on Gegetsuburi, and discovers that the zanpakuto only return to their owners' control if they are defeated by their owners. Momo and Rangiku send their zanpakutos back to the 4th division barracks, but the cart carrying them is attacked by an unknown assailant. Ichigo meets with Momo and Rangiku, then reaches Muramasa, who is having difficult using his abilities in his current body. Ichigo fights Senbonzakura, and gains the upper hand before Byakuya arrives. Byakuya reveals that he has joined Muramasa as part of following his internal desire to protect his pride, then attacks Ichigo. The shinigami discuss Byakuya's betrayal, and the discovery that if a zanpakuto is killed by anyone other than its owner, it will be unusable. Byakuya returns to the zanpakutos' hideout, and proves his loyalty by defeating and seemingly killing Sode no Shirayuki, leaving Rukia unable to use her zanpakuto. Rukia and Renji investigate Byakuya's office, but Byakuya arrives with Senbonzakura, tossing Rukia the broken remains of her zanpakuto. Zabimaru arrives to help Renji fight Byakuya and Senbonzakura, but they are overpowered and several zanpakuto, including Tenken, Houzukimaru, Wabisuke, Rurio Kujaku and Gonryomaru, arrive. The Second Division surrounds the zanpakuto, the zanpakutos' owners come out to fight them, and Ichigo confronts Byakuya. Ichigo goes to confront Byakuya, but Senbonzakura intercepts him, and he and Ichigo fight each other with their bankais. Renji and Zabimaru move to prevent Byakuya from leaving. Izuru begins fighting Kazeshini, suspecting that its personality is based off of Hisagi's suppressed negative impulses. Soifon fights Gonryomaru and Tenken at once, but is surprised by a smoke attack. Yumichika faces Ruri-iro Kujaku, and the two exchange insults. Ikkaku fights Houzukimaru, and although Houzukimaru unleashes his bankai, Ikkaku is able to break it by repeatedly attacking, and manages to withstand its final attack and claim victory. Fourth division lieutenant Isane Kotetsu and seventh division lieutenant Tetsuzaimon Iba go to assist the wounded at the scene of the battle when Ashisogi Jizo appears. Soifon fights Tengen and Gonryomaru, making some progress, but then her zanpakuto, Suzumebachi appears and attacks her. Ruriiro Kujaku gains the advantage over Yumichika, and begins to use its special ability on him. Iba and Isane attempt to retreat from Ashisogi Jizo, but Tobiume and Haineko arrive and Ashisogi Jizo paralyzes Isane's legs. Rangiku and Momo then return to help them against their opponents. Izuru manages to capture Kazeshini by tricking him into thinking he could still use his zanpakuto in order to unsettle him, but is soon attacked by his own zanpakuto, Wabisuke. Byakuya manages to defeat Renji and Zabimaru. Ichigo is desperately fighting Senbonzakura when Kenpachi arrives. 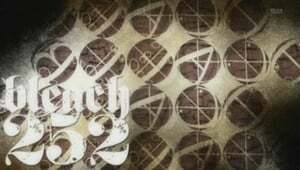 Episode 244 - The Long Awaited...Kenpachi Appears! Isane and Iba come face to face with Ashisogi Jizou, Tobiume and Haineko. It is then up to Hinamori and Matsumoto to help them out. Soi Fon continues her fight against Gonryoumaru and Tengen but things quickly become more complicated when Suzumebachi joins the fray. Ayasegawa is also having a hard time in his fight against Ruri'iro Kujaku. Meanwhile, Ichigo and Senbonzakura are both going all out to end their own fight. Ichigo continues fighting Senbonzakura while Kenpachi fights Byakuya, but Ashisogi Jizo appears and using its bankai, spraying poison gas over the battlefield, enabling Senbonzakura and Byakuya to escape. Yachiru chases Ashisogi Jizo and he gets captured by Zaraki. Mayuri blows up Ashisogi Jizo, causing it to return sealed form and break. Soifon has difficulty hitting the small Suzumebachi, but manages to defeat her, and Yoruichi congratulates her. Unohana arrives to treat the victims of Ashisogi Jizo's poisoning, including Momo, Isane, Rangiku and Iba. Yoruichi meets with Ichigo and the captains, and reveals that she knows Yamamoto's location. Yamamoto is then shown as a prisoner of the zanpakuto, with Sogyo no Kotowari, Katen Kyokotsu, and Minazuki encasing him in a barrier. Episode 246 - Special Mission! 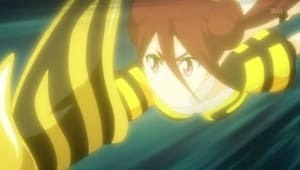 Rescue Captain Commander Yamamoto! The Captains begin planning on how they're going to rescue Yamamoto, knowing that they're going to run into high class zanpakuto. Meanwhile Kazeshini comes back to the hideout and faints from exhaustion. Kenpachi, Ukitake, and Kyoraku head into the cave while Yoruichi and Ichigo head in another way. In the cave, Ukitake and Kyoraku meet their materialized zanpakuto. In the meantime, Ichigo and Yoruichi encounter Haineko and Tobiume, and both are defeated by Yoruichi. Ichigo heads on, and is lead into Kazeshini by Minazuki. Kazeshini is easily defeated, breaking, as Ichigo moves on to find the Captain-Commander. Whilst trying to rescue Captain-Commander Yamamoto Kyouraku faces off against Katen Kyoukotsu, Ukitake takes on Sougyo No Kotowari, Kenpachi fights against Gonryoumaru and Tengen and Yoruichi is left to deal with Haineko and Tobiume. 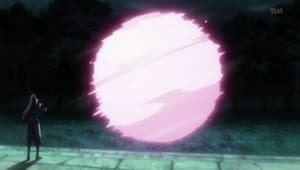 However, it soon becomes clear that the Zanpakutou are simply trying to delay their opponents as long as possible. Meanwhile, Ichigo is once again forced to fight Muramasa. Episode 248 - Dragon of Ice and Dragon of Flame! The Strongest Showdown! Ichigo and the others are trapped in the fires of Ryūjin Jakka, he and the others try to free themselves from the flames of Ryūjin Jakka, on the other side, Byakuya, Senbonzakura and Muramasa head to Karakura town to destroy it and reclaim Muramasa's owner, Kouga. Muramasa stumbles upon Inoue and blacks out. After waking up and asking Inoue who she is, Ishida and Chad arrive to take out Muramasa. Ichigo tries to escape for the final time but is almost defeated, Hitsuyuaga jumps in with Hyorinmaru and saves them, they activate Bankai together and get Ichigo out of the flames. 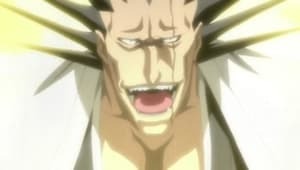 While Yamamoto, Kyouraku, Hitsugaya and Ukitake deal with Ryuujin Jakka, Kenpachi is finally enjoying his fight against Gonryoumaru and Yoruichi shows Haineko and Tobiume why she is known as the Goddess of Flash. Meanwhile, Senbonzakura and Rukia arrive to join the fight between Muramasa, Ishida, Sado and Orihime. In a flashback several centuries ago, it is revealed that Kouga was part of the Kuchiki Clan as Ginrei Kuchiki's son-in-law, and was overconfident in the abilities of his zanpakuto. 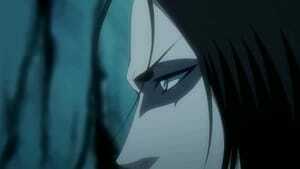 He helped put down a rebellion of Soul Reapers, but some grew suspicious of his power, and had him attacked. 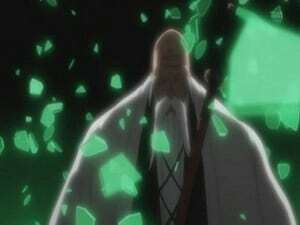 He cut down his attackers, but was framed for killing his own allies by a group of jealous high-ranking Soul Reapers. He was imprisoned as a result, but escaped with Muramasa's help. In the present, Kouga awakens, repelling Ichigo and Rukia, then suddenly stabs Muramasa. The 3 elites are gloating over their success when Kōga and Muramasa appear. Kōga kills them, and Ginrei is informed. Muramasa talks to Kōga to try and help him over his anger, but they are found by Ginrei. He inform Kōga the likely sentence for killing the Elites is execution, and Kōga goes insane. Muramasa tries to possess Ginrei’s Zanpakutō, but phases through Ginrei. Kōga removes his hairpiece, and departs. He then goes on a killing spree. Muramasa tries to reason with him but fails, lamenting that he can’t hear Kōga anymore. Yamamoto is informed of what’s going on, and Ginrei tells them how to resist Muramasa’s power, and Yamamoto volunteers to help. Kōga rants at Muramasa and threatens him. He meets Ginrei and Yamamoto for a showdown. He tries to use Muramasa on them, but he won’t release. They use this opportunity to arm with the spears used to seal Kōga’s coffin. These immobilise his limbs, allowing Yamamoto to use Kidō to imprison him. Back in the present, Kōga thinks Muramasa betrayed him, but Muramasa claims he never heard him. Kōga removes his blade from Muramasa, and tries to kill him, but Byakuya blocks the blow and challenges him. Kōga Kuchiki sees Byakuya Kuchiki’s scarf and hairpiece and, having never met Byakuya before, concludes that he is from the Kuchiki clan, which Byakuya confirms. Kōga enquires if Ginrei Kuchiki is still alive, which Bykuya refuses to answer. Ichigo and Rukia ask how Byakuya knows about Kōga, but Senbonzakura appears and tells them to just watch. Byakuya had defeated Senbonzakura right at the start of the rebellion and, on hearing Senbonzakura’s summation, immediately recognised Kōga's abilities, having been told of him by Ginrei. They decided to work as double agents to find Kōga. Byakuya states he will kill Kōga for disgracing the Kuchiki family. Muramasa offers to help Kōga, but Kōga breaks his Zanpakutō, saying he’ll just get in the way. Muramasa, in a rage, summons the Menos he’d been keeping inside himself. 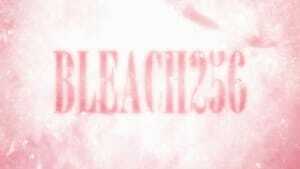 Ichigo destroys several, saying he and Rukia would fight the Menos while Byakuya fights Kōga. Neither can outmatch the other in terms of swordsmanship, so Kōga switches to using Kidō, again with neither able to gain an advantage, until Kōga uses a large scale ice spell which seemingly freezes Byakuya, though Senbonzakura releases him. Kōga catches him with an immobilizing spell similar to Muramasa’s, but Senbonzakura cuts the threads. Byakuya sems to have won, but Kōga starts using illusions to confuse him, and begins to land some hits. Kōga states that he sends his Reiatsu into his enemy to manipulate their senses, and that Ginrei and Yamamoto were immune due to closing their hearts. Byakuya says he didn’t close his, because now he can kill Kōga, instead of sealing him. Koga attacks with the sealing spears and more kidō to immobilize him agin, and tries to finish the fight, only for Senbonzakura to block the attack and free him. Byakuya activates Senkei, and the two continue to battle, with Byakuya gaining the upper hand. Byakuya decides to finish the battle, and as a mark of respect attacks with Shukei. After Kouga's defeat, Muramasa becomes unstable, as he had absorbed hollows in order to sustain himself without a master. 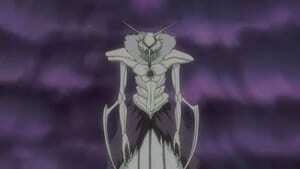 Many hollows spill forth from his body, and he transforms into a form similar to an Arrancar. Orihime tries to reach out to him to save him from his sorrow, but he attacks the group. Ichigo manages to slash through Muramasa, but he becomes even more unstable and becomes a larger dome-shaped mass, engulfing him in the process. The formerly rebellious Zanpakuto return with their owners to help Ichigo and his friends in the battle. The Shinigami and their newly deprogrammed Zanpakuto arrive to join the fight against Muramasa. However, they first have to defeat the seemingly endless number of Menos that have also appeared. Things are further complicated by the squabbling between the Shinigami and their Zanpakuto and the animosity towards Byakuya. As the dome grows unstable and the Soul Reapers fight the Gillians outside, Ichigo fights Muramasa inside his inner realm, which is collapsing from the grudges of the hollows he consumed to sustain himself. Ichigo questions Muramasa's devotion to Kouga in spite of his apparent motives for freeing the zanpakutos, and insists that he should know what a true bond between a Soul Reaper and a zanpakuto is. Ichigo defeats Muramasa, causing the two to leave his inner world. Muramasa dies after realizing the error of his ways and Byakuya thanks Ichigo. While Byakuya allows his squad to hold a sakura viewing party at his mansion, two strange attackers arrive, but one of them is quickly defeated by Sode no Shirayuki and Senbonzakura, who have since rematerialized, while the other escapes. Captain Kurotsuchi refers to these attackers as "Sword Fiends", which are zanpakuto who have killed their masters. Rukia and Sode no Shirayuki try lure out the other by having a drinking party, but fail. Soon Rukia and Sode no Shirayuki find the sword fiend attacking and defeat him together, capturing him and turning him in for study. Captains Ukitake and Kyoraku become concerned at this development, noting that the Seireitei is still being rebuilt. In the real world, Ichigo encounters a sword fiend, and he and Hitsugaya fight it, but it retreats. Ukitake and Kyoraku infer that there are at least as many sword fiends as the number of Soul Reapers lost in the war, and plan on stabilizing them to return them to sword form, despite Mayuri's lack of interest. The sword fiend is attacked by a hollow, but manages to absorb it. It overpowers Rangiku when she tries fighting it, but Ichigo comes to fight it, disarming it. 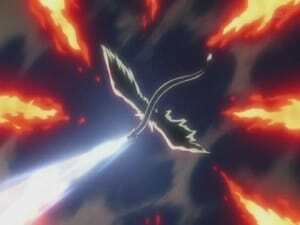 The hollow-fused sword fiend fires a Cero at Ichigo, but Hitsugaya manages to destroy it, noting that the sword fiends are more dangerous than he thought. Renji and Zabimaru come to the real world following a sword fiend. Chimpette and Snakey split up to search. They find the sword fiend quickly but he escapes. Snakey follows him and is covinced that being free is better. Snakey has trouble doing anything since most people can't see him. Karin is the only person who can see him and ends up taking him home. Renji and Chimpette are wiating in the park and Chimpette is feeling lonley because Snakey isn't there. Ichigo returns home and finds Snakey. After Snakey finds out that Ichigo is a subsititue soul reaper he runs away only to encounter the sword fiend. Snakey begins to fight him and almost wins until the sword fiend caputres Karin who was follwing Snakey. Right as Snakey is about to die Chimpette and Reji return to save him and defeat the sword fiend. Ichigo takes Karin home convincing her it was all a dream, even though she knew it wasn't. Having resolved his differences Snakey, Chimpette, and Renji return to Soul Society. Nanao, Ikkaku and Yamada are all sent to investigate Soul Society's underground waterways following a string of thefts from the 4th Squad's barracks. Despite numerous booby traps the trio soon find the culprit. However, they also find a very dangerous Beast Sword as well. Kazeshini, despite being free of Muramasa's control, attacks Hisagi when he, Ikkaku, Izuru Kira and Tetsuzaimon Iba go on a mission to fight Sword Fiends in the Rukon District. After killing a Sword Fiend, Kazeshini finds a dying man who begs him to take care of his child. Kazeshini is frequently annoyed by the child's behavior, but often shows concern for it, and abandons a chance to attack Hisagi when he hears it crying. After defeating another Sword Fiend that is attacking a woman who came for the child, he leaves the child with the woman and goes to confront Hisagi. Kazeshini faces Hisagi in one last fight, but is distracted by the child crying, and is defeated and turned into a normal zanpakuto. While Ichigo, Rukia and Urahara investigate a Sword Fiend attacking students, a girl named Kyoko Haida, who has the ability to predict the future and know things she would otherwise not, transfers to Karakura High School. Orihime tries to become friends with her, but learns that her best friend, Mai, rejected her after learning of her ability. A Sword Fiend merges with Kyoko and tries to take over her body, but Ichigo, Rukia and Orihime confront it. Orihime uses her healing powers to separate the Sword Fiend from Kyoko, and Ichigo manages to defeat it with Getsuga Tensho. Afterward, Orihime and Kyoko become friends, with Orihime accepting Kyoko's abilities. Episode 262 - Haineko Cries! The Tragic Sword Beast! While on a mission with Rangiku to fight sword fiends, Haineko encounters one named Narunosuke, whose master was a coward, and who went with the others in order to become stronger. Haineko becomes friends with Narunosuke, sneaking him food and medicine despite Rangiku and the other Soul Reapers' belief that the sword fiends inevitably lose control of themselves and Narunosuke's gradual loss of control. Rangiku arrives to deal with Narunosuke and Haineko tries to stop her, but when Narunosuke loses control of himself, Haineko is ultimately forced to kill him. Whilst trying to deliver a recently defeated Beast Sword to the 12th Squad's Barracks Senbonzakura and Zabimaru accidentally get trapped inside. The Zanpakuto then manage to upset Ashisogi Jizou, uncover some of Mayuri's unethical surveillance and destroy the 12th Squad's building. Episode 264 - Battle of the Females Katen Kyōkotsu vs. Nanao! As all the Shinigamis' Zanpakuto are struggling fighting a Sword Fiend we flash back a day before to the events that lead to this battle. Kazeshini is battling with a Sword Fiend who has been corned by 9th division, as they get separated Kazeshini is about to give the fatal blow the Sword Fiend turns back to a regular sword. Later on when Kazeshini, Zabimaru, Hōzukimaru and Fuji Kujaku (Ruriiro Kujaku) gather together they discuss how they found "that Sword Fiend". They discuss how the Sword Fiend from early turn back because he had lost so much reiatsu. We learn how the Zanpakuto only so much reiatsu that they receive, when the gained their physical forms and once they lose all that reiatsu they turn back to swords. "That Sword Fiend" apparently can steal other Zanpakutos reiatsu and that he has surpassed his masters strength. The Shinigamis' Zanpakuto then decided to take care of "that Sword Fiend" so as not to put their masters at risk.